June 27th, 2016 – In 2013, WorldLoop formed a partnership with the United Nations Industrial Development Organisation (UNIDO). WorldLoop recognised UNIDO’s vast knowledge in promoting sustainable industrial development in developing countries and shares UNIDO’s vision on the Best-of-2-Worlds model for e-waste recycling. UNIDO recognised WorldLoop’s hands on experience in the management of e-waste recycling projects, including project selection & monitoring, providing technical assistance, and the disposal of hazardous materials. The partnership materialised with collaborative projects, in Tanzania and Ethiopia. From June 13th until June 15th, WorldLoop’s Project Director, Sam Van Dyck, offered a 3-day training to the technical staff and management of the Akaki DMF dismantling facility near Addis Ababa, Ethiopia. On the 1st day of the training, WorldLoop provided a training on the importance of Health & Safety on the work floor, followed by a short presentation on dismantling techniques for desktop computers and how to identify and sort the different components in a computer. The technical staff was explained how to depollute a computer and how to sort the different qualities of printed circuit boards (high grade, medium grade and low grade). A practical training sessions on the dismantling of a PC and the identification of different fractions and hazardous materials was provided, including the identification of the different qualities of printed circuit boards and how to best dismantle and treat them to get the optimal value when recycled. There was special interest on hazardous materials in e-waste and how they should be properly handled and stored as not to affect the health of both technical staff and the environment. The second day of the training started with a theoretical training on dismantling a CRT TV/ Monitor, the composition of a CRT TV/Monitor and the hazardous components inside a CRT TV /Monitor. 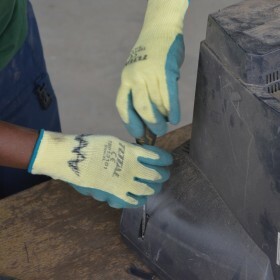 A practical exercise on the dismantling of a CRT Monitor followed during which the importance of health and safety measures and equipment was stressed. The afternoon was dedicated to the best and optimized workflow for the new facility. The morning session of the third day of the training was spent on both theoretical and practical training on how to dismantle a laptop computer and a LCD monitor. These materials are not yet dismantled by Akaki DMF but should become part of the inflow of used ICT materials in the near future. During the training session the different fractions inside a laptop and LCD monitor were discussed in terms of value, hazardous materials and best way to dismantle and store the different fractions. Identifying and sorting the different qualities of PCBs was an integral part of the training. The afternoon sessions was focused on transboundary movement of e-waste to recycling partners in Europe and business opportunities. UNIDO’s and WorldLoop’s collaboration truly makes a difference in promoting sustainable and environmentally friendly solutions for e-waste, and creates awareness on hazardous fractions environmental and health dangers: thanks to this training Akaki DMF will become in the near future a good example of an e-waste collection, dismantling and recycling operation in Sub-Saharan Africa.